Today I have another card inspired by the Online Card Classes Holiday Card Workshop. I seriously love these classes! They just motivate me to PLAY and THAT, my friends, is an awesome thing! No pressure, no deadline, no requirements... just PLAY WITH ALL OF THE THINGS!!!! So, anyway, today's card was inspired by the embedded ornament card that Jennifer McGuire created for the class. I loved the idea of an ornament that could be pulled from the card. My execution didn't work as well as I had hoped, but I think if I create a second one I can correct some of the issues. Another option with this card would be to use a bit of magnet tape on the back of the pull-out piece and create a magnet instead of an ornament, which would be great for cards for all occasions! I inked both the die cut circle ornament (layered three times to give it some Ooomph!) and the background piece individually. I then stamped and embossed the wisemen and the star from the Blessed Christmas set from Paper Smooches onto the ornament. 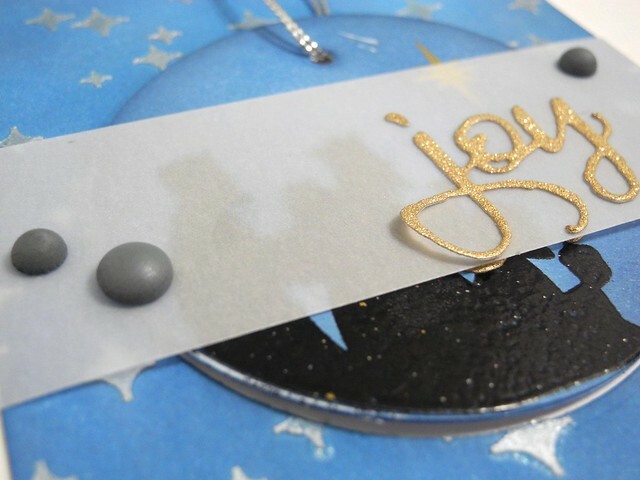 On the background, I used the Sci-Fi Star Creative Screenings stencil from Winnie & Walter with some pearlescent embossing paste to create a shimmering, starry background. The sentiment is from the Winnie & Walter The Big, The Bold, and the Merry Cutaways set. Which I love. With all of my heart. And all of my soul. And all of my inner most being. (Wait..that might be your soul... hmmm... I suppose that's a philosophical discussion for later....) I cut it twice, so it is on the ornament and on the vellum, leaving the card looking halfway decent even after the ornament is removed. But only half way. HA! Here you can see a bit what the ornament looks like outside of the card. I like this idea and I want to play with it a bit more. It is certainly a fun way to include a small gift with your card AND encourage people to keep your art. I am also entering this card in the Paper Smooches Sparks Anything Goes Challenge. LOVE that there's a real ornament that you can use there, and it fits the card so perfectly! Such a cool idea!! Great card and ornament! This is such a cool idea, and your ornament is so pretty! Fabulous idea and card,love the colours. 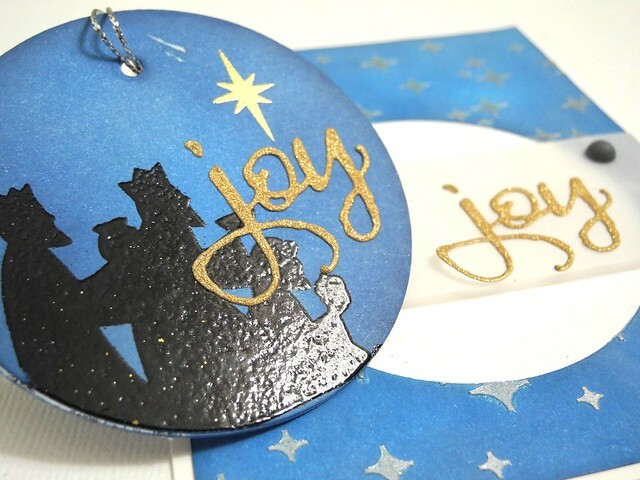 What a great idea, Jennifer - love your ornament card! Gorgeous! I still want to do an OCC, just need to find the time. And yes, that sentiment is beautiful! This is beautiful. I love the vellum covering part of the design. cool-love that you can remove it and the card is still looking good! Absolutely ah-mazing! Love the black embossing on the ornament, so pretty! So pretty...and COOL! Love the ornament!